REVIEW: Missha Creamy Latte Cleansing Foam - Chocolate! You'll have to excuse the crap quality of some of my posts for now. I have a little setup at work that produces better results than what you see here. Today I'm doing a review for my newest facial wash! I saw another review for this & decided I wouldn't mind trying this considering how affordable this is. The packaging is super cute & clean. The back of the tube is all in Korean, so the only English is on the front. Containing milk ingredients, it makes your skin clean, moisturized, and nourished. The cleanser is a really shiny, tan color, something I wouldn't have expected when dispensing the product, but I like it. The smell.... I have to take a minute... This smells EXACTLY like chocolate Tootsie Rolls! My childhood comes back to me each time I use this! With or without a facial sponge or scrub, this actually lathers up really well. I might just buy the other two flavors of this product. I love this facial wash & I love it even more paired with my facial scrub. My face feels squeaky clean & moisturized. My skins condition has greatly benefited from using this every night. You really don't have to ask me what I rate this. A solid 5/5 for this gem! Sorry if this post is so short, this cleansing foam is amazing. So what are you guys doing for Halloween? Me & my roommates have planned a party Halloween night & I hope it's gonna be super fun! 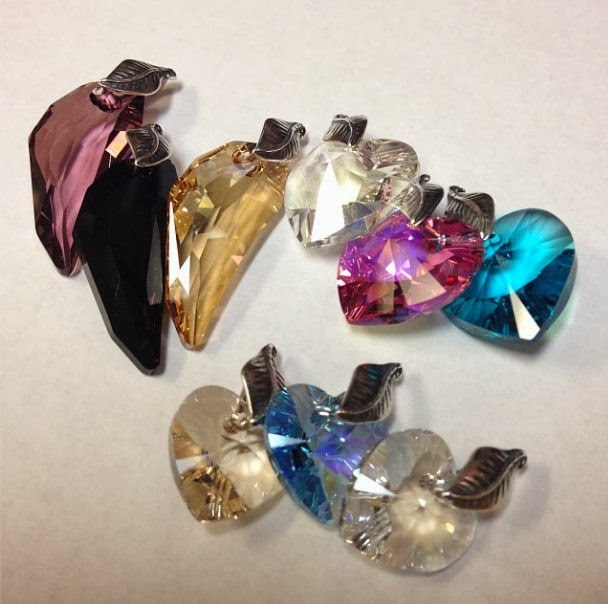 I recently bought these awesome swarovski pendants from Artbeads.com! They're super pretty! My eyes... SO PRETTY! I love mix & matching these up to create different looks. I posted this on my Facebook page, so if you wanna keep up to date with my day to day life, please head on over to OBVIobsessions Facebook Page & like it to keep up! ACCESSORIES HAUL: Forever21, Charlotte Rousse, Ulta! Just posting a quick mini-haul of what I purchased today at the mall. I initially went in looking for a black lace dress for a Halloween party I'm attending this weekend, but decided some accessories would suffice & that I would find something out of my own clothes to wear. NIFTY! Let's start with Forever21 ! I've been in search for some cute midi-rings for awhile & luckily, Forever21 now carries them. I bought the Hope bracelet bc I love the link chain SO MUCH! Next, Charlotte Russe. I bought a ton of headbands! Thankfully they were having an accessory sale! Gold & diamond devil horns. Love these. Spikes! I didn't know one was missing but it's a good thing I don't plan to wear this all the time! Gold & Pearl kitty ears. I have to do work on this one as well. I might replace the pearls with other pearls. I've been looking for one of these forever. I can deal with fixing it up! I don't quite know how to describe this headband. Definitely reminds me of the 50s. Just picked up the lightest shade of foundation I could find for a "dead" look for tomorrow as well as some Urban Decay Setting Spray so my makeup doesn't go haywire in the middle of the party. I might decide to do these more often when I'm able to go to the mall. I hope you'll enjoy these little posts! MONTHLY BEAUTY BAG: October 2013 Ipsy Bag! Hello darlings. It's been awhile since I've done an Ipsy Bag post. I should start keeping up with things like this & start incorperating more things into my blog that seem interesting. I'm going to start babbling... ^^; Let's get started with this months bag! This months these was "Love of Beauty is Taste. The Creation of Beauty is Art." Inspiring quote, I received 3 full sized products & 2 deluxe samples! It's a mix between a blue/purple to me. Really pigmented & pretty. Not normally something I would wear, but I love the way it looks on me. Not really a color nor texture I like. I didn't notice any plumping after wearing it for awhile. Not my favorite of the bag. I'm always up for trying new facial products, so I'm really excited to try this one out. It's such a pretty blue color! I actually traded a product I didn't want to my mom for this, so I'm EXTREMELY happy about it. The colors are super pretty. I love the red/red-orange shadow the most! I don't always have the best of luck with hair sprays, maybe this one will help my frizzles! Have an even better day tomorrow! Hello again darlings. I'm back with another lens review from Beautylenses.com! This time, I'm doing a review on their Green Glam Slam lenses! For some reason, the photos I had taken of the box & the vials the lenses came in aren't on my phone or computer, so I'm very sorry for the lack of photos. The difference between the box these came in & the Misty Night lenses is the name on the bottom is Glam Slam Green, the product code is different, & the vial top is a Green color to signify the color of the lenses. Everything else, including delivery package as well as how they came wrapped & the lens case included, was the exact same. I want to put more input on BeautyLenses.com & their customer service. One of the lenses I had received must have had a defect on them, as they didn't sit well with my eyes & made a scratchy sensation when wearing them. BeautyLenses was kind enough to send me a replacement lens in place of one that was bothering me. That's definitely a perk for me, seeing as these are an amazing pair of lenses. Thanks Beautylenses! Let's see the lenses up close now! [ MATERIAL ] Soft Hydrogel (Poly HEMA), saline. [ DESIGN ] 5/5. I already have a natural green/hazel eye, so these really put emphasis on my eye color & make my eyes stand out much more than they would on their own. They don't quite blend into my eye, as the inner yellow ring doesn't match my natural eye color, but these lenses are super pretty as is. [ COLOR ] 5/5. These lens have a small inner ring of yellow fading into the main color, green, rimmed by a black outlining. The green is also quite vibrant when worn. [ COMFORT ] 5/5. Another A+ for amazing comfort. As you know, my eyes are the way they are, but with these lenses, I don't always have to apply drops. My eyes seem to adapt to these lenses very well. [ ENLARGEMENT ] 4/5. With only a 14.5mm, these are smaller than the previous lenses I've reviewed. However, I still get the dolly eye effect I love. [ OVERALL ] 5/5. Beautylenses is keeping up with the good work selling wonderful lenses. Beautylenses.com has got to be my favorite lens site now. The service is amazing as well as the overall quality of the lenses. To get a discount on your order, use the code ASHLEY when checking out! Anything to help my amazing readers! I hope you've enjoyed this review! Sorry for the lack of photos my darlings! Hope you have a wonderful day & an even better one tomorrow! REVIEW: Etude House I Need You Honey Wash Off Pack! While I'm actually wearing the last of the masks right now, I figured it would be fitting to do a review on Etude House's I Need You Honey Wash Off Pack. This has 4 different masks types all mixed in with some amazing honey goodness. I think the packaging is really unique. Four separate masks to try out in cute little portions! Etude House Honey Wash Off pack, formulated with 4 types of eastern medicinal herbs and honey in separate packages to soften, pamper and nourish skin. Gently massage the product onto cleansed skin, avoiding contact with eyes and mouth. Leave on for 10 minutes and rinse off with warm water. I'm going to break down each of the masks as to what benefits they provide, how they look, & how they worked on me. The smell reminds me of something in my past. I'm not sure if it's an alcohol, but it does remind me of it [ how bad! ]. My skin is noticeably softer after use. My pores also looks much less refined then before use. Although, I'm not sure if I'll continue use of this mask. After applying, parts of my face started to feel itchy. I wasn't sure if it was the extract or the honey, so I needed to try the others to make completely sure what it was. The mask is light yellow in color. Such a strange smell, but purfumey, if that makes sense. Like a scent a grandmother would wear. The mask is darker in color than the rest. This one doesn't make my skin itch at all, thank goodness. This was also moisturizing as well. I didn't notice a change in my skins elasticity though. 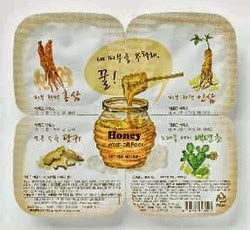 The regular ginseng mask has the same smell as the red ginseng mask. This is also a yellow colored honey mask, with the exception of little beads for exfoliation. Same outcome as the red ginseng as well. I wasn't able to take a picture of this one. The mask is also yellow in color with the exception of some red beads for exfoliation as well. Out of all the honey masks, this mask smelled the best. It has a floral scent that I really liked. It started itching around my chin & upper lip area, but I would rather wear this one more than the others. My skin feels amazingly clean after use. They're all sticky to the touch. I recommend using a clean foundation brush to apply all of these masks on to avoid making a mess. You also don't need a lot of product to cover your face. The picture above shows how much mask was left after applying it to my entire face. I either clip the packaging closed with a small chip clip & put it in a container in the fridge or transfer it to a small container. These masks definitely have more than one use. Overall, I think these masks are pretty cool, but I'm not a fan of how sticky these are. I should have probably gone with the Yogurt option instead of this, but for what it's worth, this is a pretty good product. 3/5 stars. I hope this review was helpful & I hope you've enjoyed it as well! HAUL: Freeman Spooky Mystery Bag! DARLINGS! This wasn't what I was normally going to post, but I literally HAD to post this today. About a week or so ago, I got an e-mail about this mystery bag Freeman Beauty was selling for Halloween. In the e-mail, it stated that this bag was worth $90! Of course I had to jump on this as soon as I was able to, & I finally received my package today! I wanna start off first by pointing out exactly what I bought to get free shipping as well as masks I wanted full sizes of. The Mint & Lemon Facial Clay Mask [ travel ] [ full ] was a freebie the company sends with all orders. Those items are just what I got to receive free shipping on my order. 15 products valued at $90, all for $20, which is AMAZING! Especially since the most expensive product pays for the entire bag. This is another promo I suggest getting before the month lets out. Sorry this isn't my usual post, but I just had to get this out there for any beauty junkie that loves masks or products like the ones you see here. I hope this post was helpful either way! MINI-REVIEW: Etude House Sweet Recipe Baby Choux Base - Berry Choux! Good morning darlings. It's almost Friday... I didn't mention this before, but my birthday is tomorrow & I'll be turning 22 *abruptly starts singing Taylor Swift* ! Another year under my belt :). Did anyone else watch the season premier of American Horror Story: Coven? Back when the whole AMC series started, I actually watched the very first episode, but unfortunately couldn't get into it. This season, however, is centered around my city's heritage & I must say, me & hunnie are HOOKED. Looks like my DVR will be set to record the entire series. Makes me wish I would have been interested in the other series! Enough about that, let's get into this mini-review! I ordered this along with two other makeup bases from TesterKorea awhile ago. I think the sample package for this is insanely cute. I believe they have samples for the Apricot Choux as well, but this one caught my eye better than the other, however, I'd like to sample all three if possible. The base is a very light pink color, though in the picture, it looks more peach. The bathroom lighting didn't do it any justice! I LOVE LOVE LOVE this makeup base. I love how the consistency is smooth & easy to apply. I love how easy it blends into the skin. I love how amazing this smells. Like STRAWBERRIES. I love how visibly brighter my skin looks as well as how wonderful my BB's apply & look with this makeup base. I love this more than my It's Skin Babyface Base [ x ]. I don't think I could praise this little gem any more. It's truly that amazing. As soon as I'm able to, probably next haul, I'm definitely getting this in a full sized container. I honestly cannot get over how well this base has worked for me. 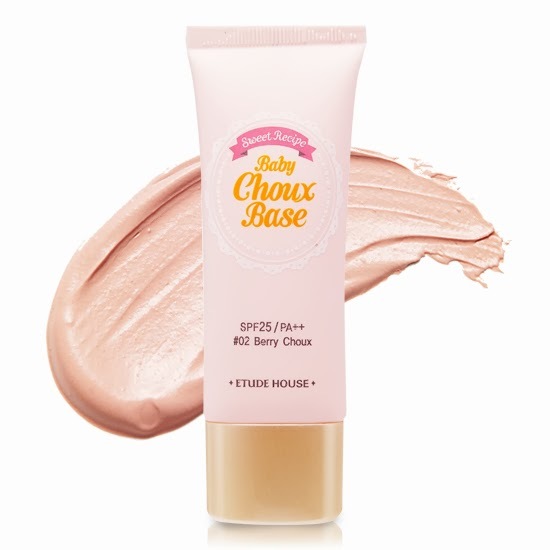 I'm still trying out a Holika Holika base as well, & there will be a review on that, but I honestly feel like nothing I've used before can completely compare to how wonderful this base has been to me. Hope you've enjoyed this mini-review. Looks like my posting dates have changed. I'll most probably be posting a review & mini-review each week. Hope that's okay! Have a wonderful day & an even better one tomorrow!